These ginger tea recipes make it easy to enjoy this spicy, refreshing drink – whether you’re making ginger tea simply because you love the taste or because of the many ginger tea health benefits. Whether you prefer your ginger tea hot or iced, with fresh or ground ginger, you’ll find a recipe here. When you make these ginger tea recipes, you may find you want more or less ginger flavor in your tea. If so, simply add more or less ginger next time to suit your tastebuds. You can also add some cooling peppermint to your tea if the ginger is too strong. Suggested amounts are provided at the end of each recipe. 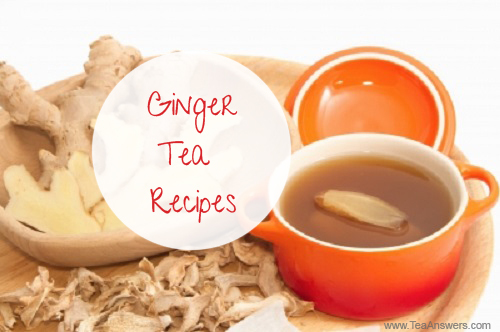 The ginger tea recipes make 1 serving, but it’s easy to increase the amounts to make more. Place ginger in a saucepan. Bring to a boil. Reduce heat and simmer for 10 minutes. The water will darken and become fragrant as it cooks. Strain the tea into your mug. Add sweetener to taste if using (honey is my favorite). Note: If ginger tea is too strong for you, you may want to try it with peppermint. Dried peppermint can be added at the beginning with the ginger root, or fresh peppermint can be added in the last 3-5 minutes of cooking. The peppermint will cool the ginger while allowing you to reap the full benefits of ginger tea. Place ground ginger in a mug. Add hot water and stir well. Note: If ginger tea is too strong for you, you may want to consider adding some peppermint to it. Steep 1 teaspoon dried peppermint or 1 Tablespoon fresh peppermint in the hot water for 3-5 minutes. Strain and then add the liquid (now a peppermint tea) to the mug with the ground ginger. The peppermint will cool the ginger while allowing you to reap the full benefits of ginger tea. Bring to a boil. Reduce heat and allow to simmer for 10 minutes. The water will darken and become fragrant as it cooks. Strain the tea into a glass. Add sweetener. Stir to dissolve. You can add ice and drink it right away. However, if you allow it to fully cool first, the tea will be nice and clear, rather than cloudy. Note: Iced ginger tea is really tasty with a squeeze of fresh lime juice added to it just before serving.